Alliance Group is a premier global investment firm that strives to provide solutions to create sustainable and lasting value for their partners, the companies they invest in and society at large. 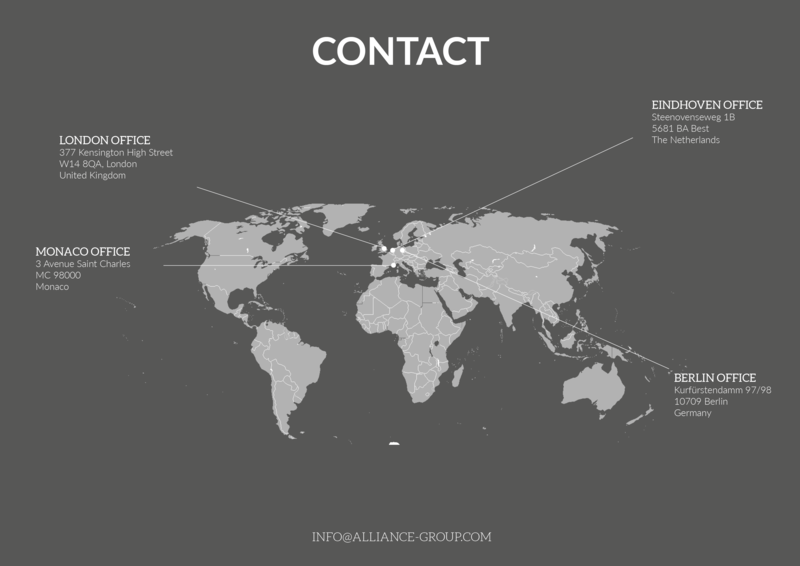 The Alliance Group has offices in the United Kingdom, Monaco, Luxembourg, Germany and the Netherlands. The creation of value is the basis of Alliance’s business: through an extensive and expanding global network, deep industry knowledge and specialists, Alliance forms a significant standing capital syndicate and is able to create and execute a customized value-added plan for each of it’s business ventures and opportunities. Years of experience have enabled Alliance Group to become a valued partner that is familiar with all of the relevant aspects of today’s global real estate markets. With a focus on partnership and the right network to act globally, cross-border projects come naturally to Alliance Group. Alliance Group’s main focus is deal origination, transaction/structuring, equity investing/providing capital and asset management. This is done with in-house experts. All of these segments reflect Alliance Group’s strong partnership culture, commitment to steady performance and uncompromising integrity. From the outset, Alliance Group’s success has been built around a single core concept: Partnership. The relationships we have developed with key individuals, families, companies and funds around the world have provided us with both deep industry expertise and access to significant proprietary investment opportunities. Our strong partnerships with investors have allowed us to put capital behind these opportunities. Because of the partnerships, we have built a significant global team that works as one to create value in all investments. In a partnership with Alliance Group, benefits from decades of financial and operational experience, broad industry knowledge, and a powerful network of global relationships is the basis of every opportunity. Through an integrated approach, we work closely with (real estate) companies and investment partners around the world to deliver flexible capital solutions. The power of those partnerships is expressed in the common goal for better investments, stronger businesses, and most of all shared success. Senior relationships with major financial institutions and therefore having first access to distressed opportunities. Extensive relationships with major listed and private property (real estate) companies combined with the ability and credibility to approach at board level. A significant network of agency connections resulting in first access to deals. A high level of experience in sourcing and structuring joint ventures with the “best in class” property, companies and developers. Alliance Group’s strategy is to realize high yield returns versus controlled risks by managing calculated challenges with over 3 decades of experience. Through more than two decades of global economic cycles and changes, Alliance Group has grown and evolved into a global investment firm with a €10 billion-plus track record. Although this track record is mostly formed by real estate transactions the Alliance Group never turns a blind eye to business opportunities may they fall in line with the beliefs and values of the Alliance Group.